The RFC10 submission standard requires that the restriction site sequences for the Type II restriction enzymes XbaI, EcoRI, PstI, and SpeI are absent from the DNA sequence of a submitted part. This submission standard may require users to alter their part's sequence through the introduction of silent point mutations, but will allow future users to utilize the part in their devices using BioBricks assembly. These four restriction sites were chosen due to their low rate of occurrence in the E. coli genome, which has been one of the most popular chassis in synthetic biology since its inception. This does not mean that Registry users are required to use BioBricks assembly to build their devices; rather, it gives all users and teams the option of utilizing the BioBricks assembly method to string together parts they obtain from the Registry. iGEM Headquarters does not require teams to follow any specified assembly method; rather, we require teams to follow a submission standard in order to be eligible for medals and prizes during the competition. 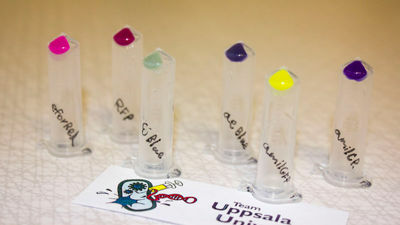 This gives teams the flexibility to utilize any assembly method they desire during the competition while maintaining the usefulness of the Registry by requiring any submitted parts have to adhere to one submission standard (RFC10) for those interested in building devices following the BioBricks assembly method. The iGEM Registry of Standard Biological Parts is a collection of over 20,000 documented genetic parts. Visit the iGEM Registry and browse by part type, chassis, function and more. Open to iGEM teams and academic labs. We have worked on creating collections of featured parts. Collections are groups of related parts based on current technologies, downstream applications, or notable features. For more on our collections or to browse the collection you can go to the Collections Page. Below are some of the highlights of our Registry Collections. The Registry is an open community that runs and grows on the "Get, Give, & Share" philosophy. Users get parts, samples, data, and tools from the Registry to work on their synthetic biology projects. They'll give back to the Registry the new parts they've made, as well as data and experience on new and existing parts. Finally, users will share experience and collaborate in the Registry's open community through their wikis, the forums, and other social tools. 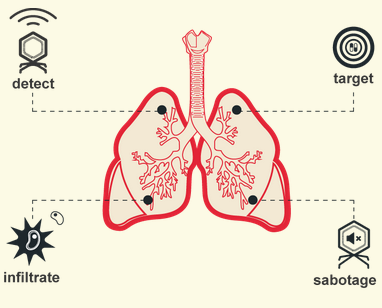 The Registry is a continuously growing community collection of biological parts that can be mixed and matched to build synthetic biology devices and systems. Founded in 2003 at MIT, the Registry is part of the synthetic biology community's efforts to make biology easier to engineer. It provides a resource of available biological parts that have been user-tested and characterized for users developing synthetic biology projects. The Registry provides these resources for the continued growth of synthetic biology in education, academic research, and new industry. 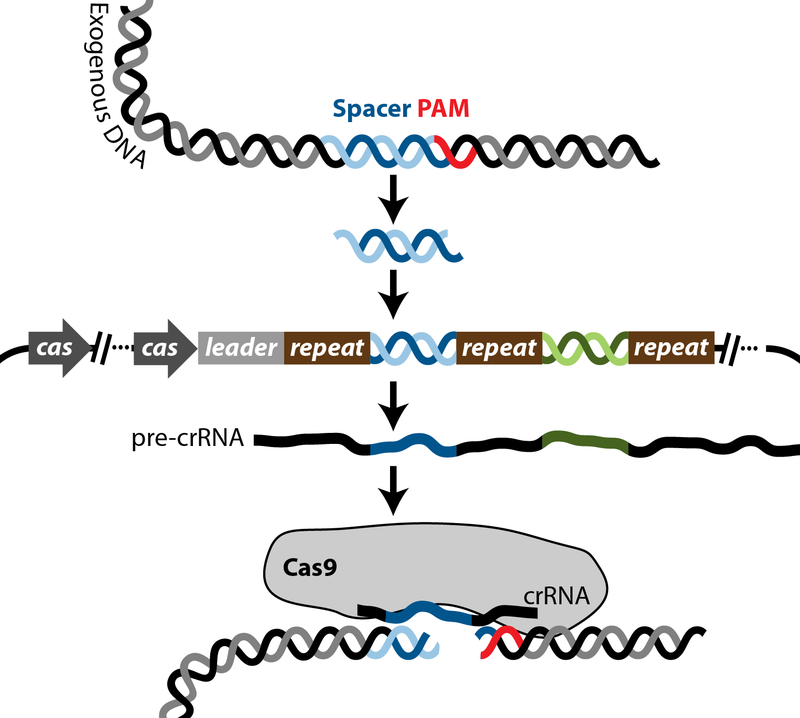 CRISPRs (Clustered Regularly Interspaced Short Palindromic Repeats) are specific regions in some bacterial and archaeal genomes that, together with associated Cas (CRISPR-associated) genes, function as an adaptive immune system in prokaryotes. Invasive DNA or even RNA can be specifically recognized and efficiently cleaved. Reporter protein coding sequences encode proteins whose presence in the cell or organism is readily observed. For example, fluorescent proteins cause a cell to fluoresce when excited with light of a particular wavelength, luciferases cause a cell to catalyze a reaction that produces light, and enzymes such as beta-galactosidase convert a substrate to a colored product. This toolkit allows users to stably integrate devices into the host genome, thus avoiding problems associated with using plasmids. The parts in the miniTn7 BioBrick toolkit are based on the excellent set of miniTn7 derivatives developed by Choi et al. (2005). 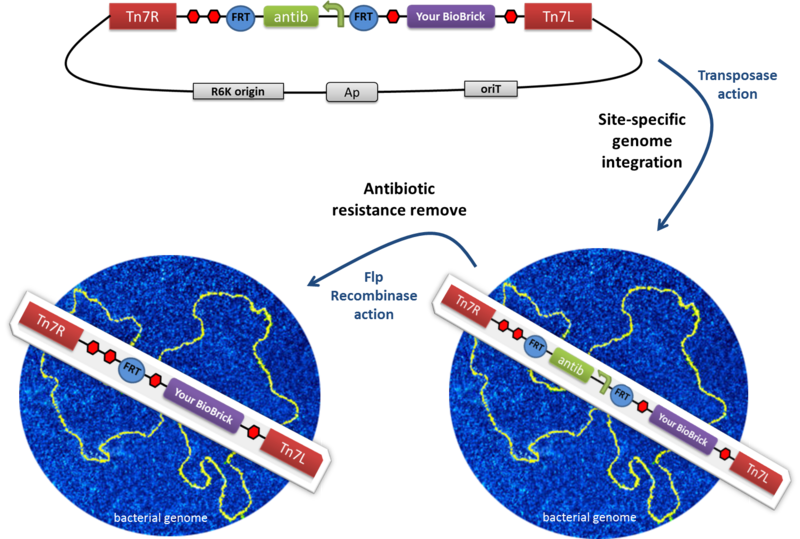 All of the kit derivatives contain the Tn7-L and Tn7-R ends, an antibiotic resistance gene flanked by FRTs and the prefix/suffix BioBrick-compatible multi-cloning site. One of the tasks which microorganisms can do well is produce medically useful molecules. One of the first examples of such a case is using genetically engineered E. coli to produce insulin (called "Humulin") for diabetics. The company Genentech was founded to commercialize this venture and still exists today as a wholly owned subsidiary of Roche.